With the start of school, our family has the opportunity to evaluate how to begin the mornings well. Sometimes the morning doesn’t seem like the best time to spend with God- especially if you’re not a morning person. I’ve confessed to you before that I try to be a morning person. But that’s hard to do when you don’t even like mornings. However, I know from experience that no time with God in the mornings is a bad idea. So even a few minutes is better than none. I love to pray before I even get out of bed and read while having coffee. I have other focused times carved out of my schedule to spend more time with God throughout the day. 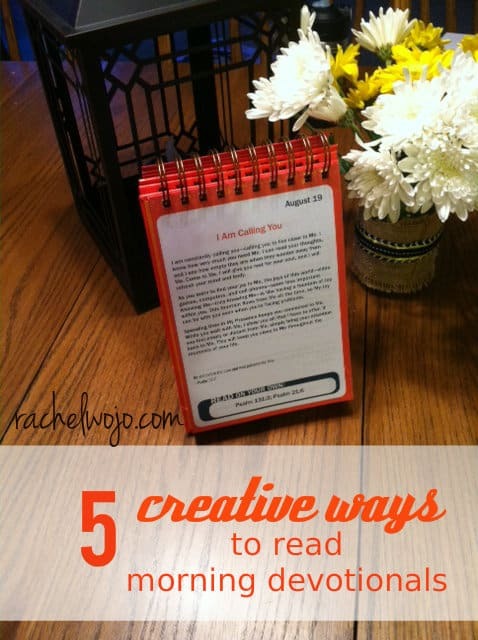 But back to mornings…today I wanted to share 5 creative ways to read morning devotionals. Some may be ideas you’ve done and maybe you’ll find a new idea or two in the mix. 1. Have someone read aloud during travel time. 2. 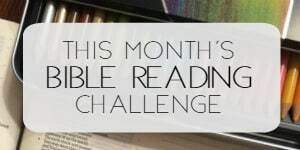 Use an audible devotional. If you drive alone in the mornings, one of my favorite devotionals, Jesus Calling, is available in audible app format to play on Kindle and Apple products, as well as an audio cd. How cool is that! 3. 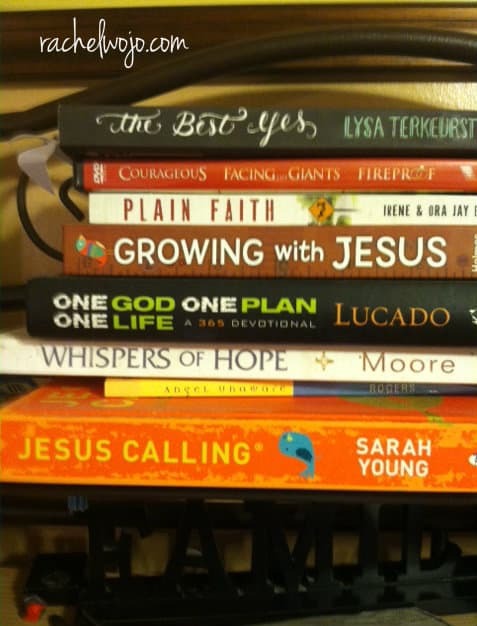 Have a grab bag of devotionals. Having a few options and not feeling like it has to be the same pattern each day can be a great way to keep interest of all those participating. 4. Keep a devotional in the bathroom. Hang it beside the bathroom mirror to read while brushing your teeth. Read it while you’re waiting for the shower water to get hot. Or other things, which I’ll leave to your imagination. Don’t you just love it?! We sure do! Although my highly spiritual children *might* have been known to fight over who gets to turn the page. Just maybe. I won’t say for sure. 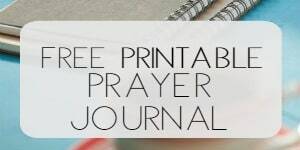 And while this children’s version is working great for us, what if you placed the regular Jesus Calling perpetual calendar in your kitchen window or beside the sink to read and meditate on while you wash dishes? or on your office desk? With that, bloggers, I’m super excited to have you for Whimsical Wednesday. I hope you found lots of whimsy above and can’t wait to read all of your encouraging posts! Post contains affiliate links; site may be compensated if purchase is made. See full disclosure policy here. I love this idea. I’ve been trying to find a way to share daily devotions with my kids but morning and evening times can be so hectic and crazy. I love the daily calendar and hope to get one to use at the dinner table. Thanks so much for sharing! I say YES… I loved this. and now I don’t feel so crazy. 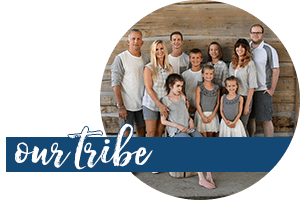 I put a devotional in my bathroom because sometimes it is the only time I am alone in a household with seven children……..
Prayers in a perpetual calendar format would be sweet, Rachel. Great idea. Most defiantly YES! !!! LOVE the idea. What a great way to start the day. It gets so crazy so fast.